I am using the details for the RoundCube database as an example, please replace the values as per your choice for security reasons. // The IMAP host chosen to perform the log-in. // required to match old user data records with the new host. // with any configured cipher_method (see below). // connect to http://spell.roundcube.net which is a hosted service provided by Roundcube. // You can connect to any other googie-compliant service by setting 'spellcheck_uri' accordingly. Then press "continue" in the web installer. On the following page, press on the button "Initialize database". The RoundCube login is the email address and password of an email account that you create later in ISPConfig. 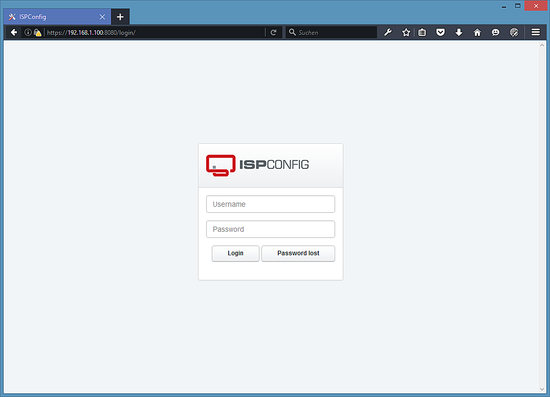 The ISPConfig installer will configure all services like Postfix, Dovecot, etc. for you. You now also have the possibility to let the installer create an SSL vhost for the ISPConfig control panel so that ISPConfig can be accessed using https:// instead of http://. To achieve this, just press ENTER when you see this question: Do you want a secure (SSL) connection to the ISPConfig web interface (y,n) [y]:. Afterwards you can access ISPConfig 3 under http(s)://server1.example.com:8080/ or http(s)://192.168.0.100:8080/ (http or https depends on what you chose during installation). In order to learn how to use ISPConfig 3, I strongly recommend downloading the ISPConfig 3 Manual.